We left Sandwich by following the south bank of its river, the Sandwich Haven. We eventually rejoined the Saxon Shore Way at a bridge over a smaller, tributary waterway called the Vigo Sprong. 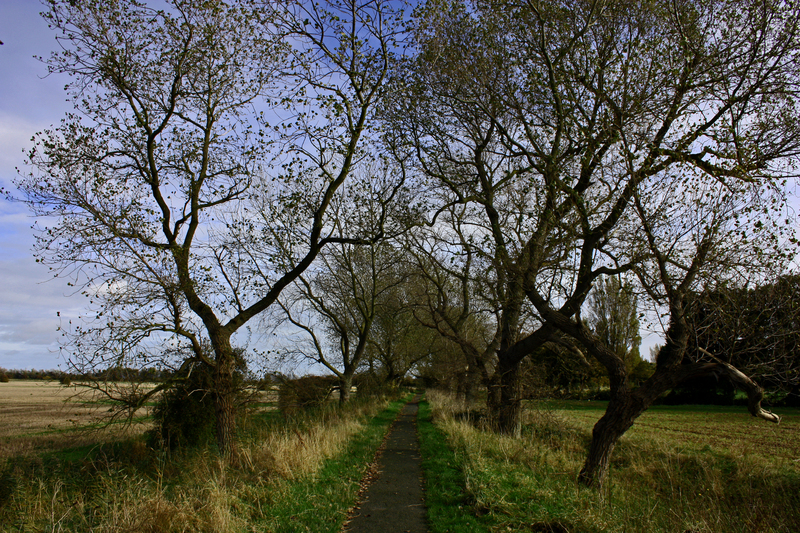 This took us east, along a tree-lined path which must look stunning when the leaves are turning. This path eventually took us to the Royal St George’s Golf Club, one of the premier UK clubs and which is on the Open rotation. We could see immediately that it was very well tended and harder to play than most. The greens rolled in all directions and surely putting here would be impossible! There were very few people playing as we followed the right of way across the course. Was this a sign of exclusivity, or just that the course was so difficult? 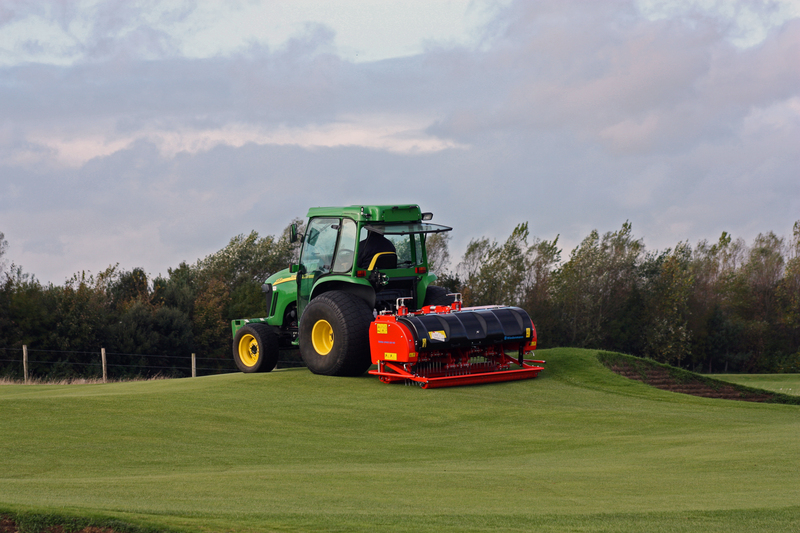 The only activity going on was a tractor spiking a green. 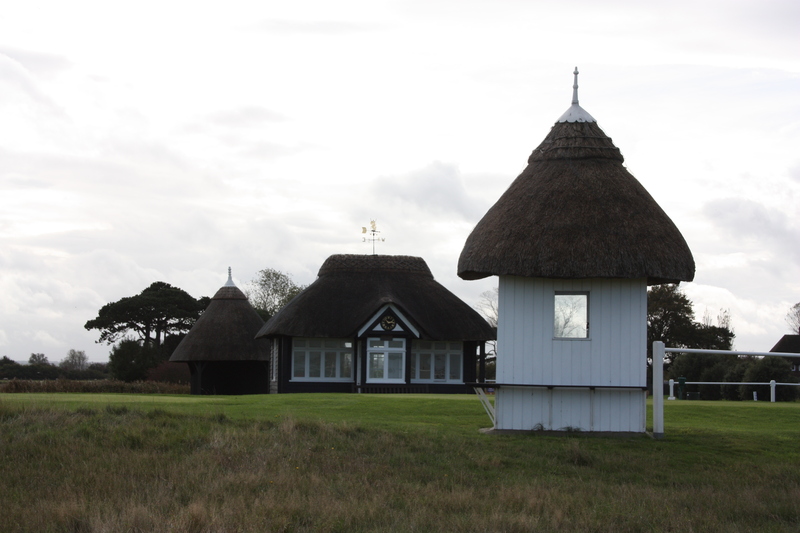 Beautiful looking rest huts and other buildings, all with thatched roofs, adorned the course. 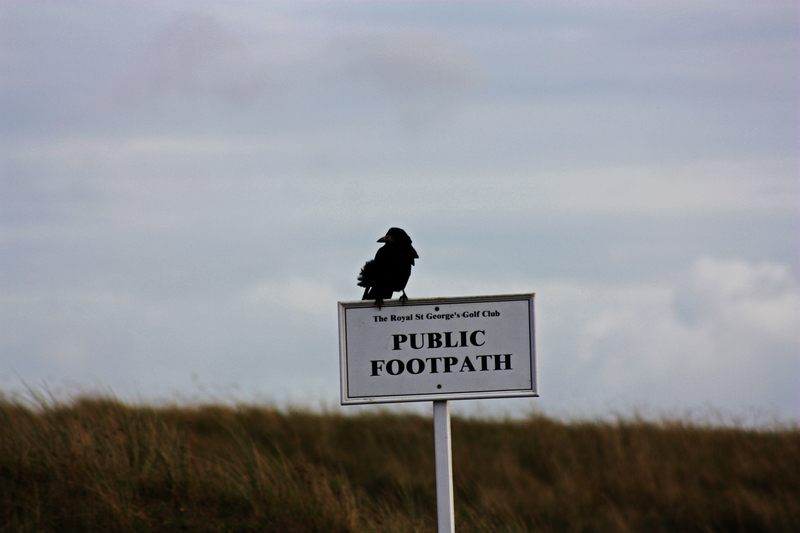 There were signs up everywhere warning us to look for flying golf balls tracing a trajectory in our direction, but in fact the course seemed particularly quiet today. Rooks outnumbered people by about 10 to 1. The path through the golf club took us back to the coast at Sandwich Bay, where we had a straight run in to Deal, along a three mile stretch of shingle beach. We decided to walk along the shingle – it would be a taster for Chesil Beach in Dorset, where it is said that a 10 mile spit of shingle feels like a 20 mile walk. Mussel shells had dominated the shore at Botany Bay, and limpets and periwinkles were in abundance at Broadstairs. Here in Sandwich Bay it was the turn of the razorshell to be the primary find. 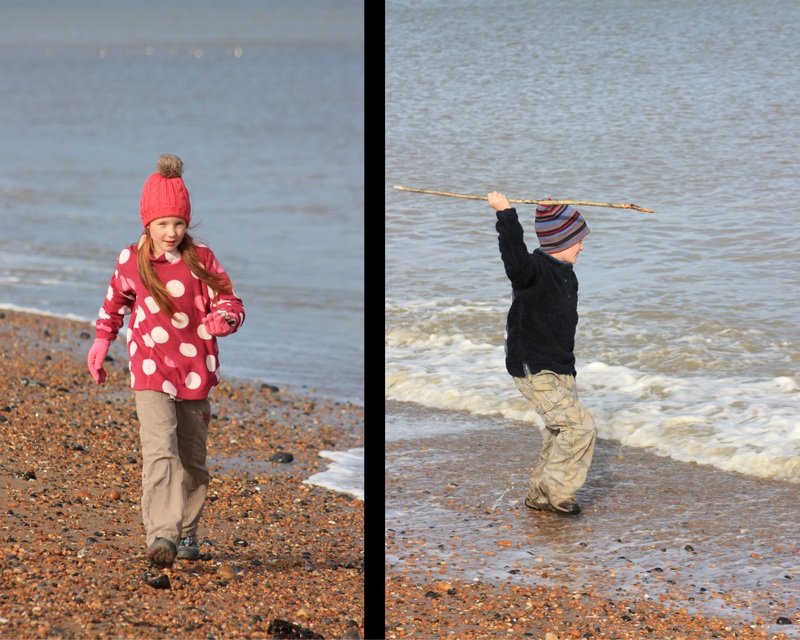 As our daughter collected shells, our son tried to attack the water (I thought he was spear fishing, but he insisted he was fighting back the waves as they rolled in). We lasted precisely three quarters of a mile walking on the shingle; it is clear that we need a bit more practice before we get to Chesil Beach. It was hard going, and threatening clouds firstly followed us and then overtook us. We opted for the quicker pathway running alongside the beach. We arrived at Deal and sat down to wait for our taxi. As it pulled up the first spots of rain started to fall. We got into the taxi. We had walked over 10 miles in just under 4 hours 46 minutes, the weather following us all the way. Had we taken 4 hours 47 minutes we would have been soaked through, for the rain started pouring down as we pulled away. The taxi driver had timed his arrival perfectly. 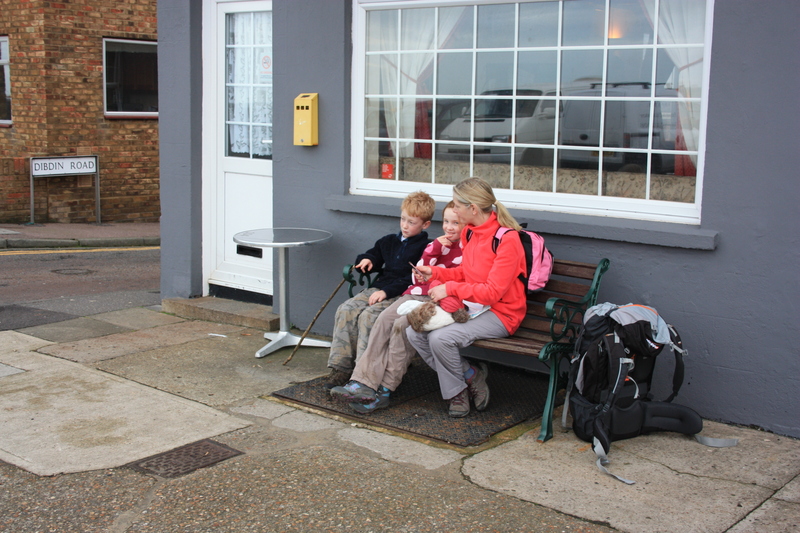 This entry was posted in Kent and tagged coast, deal, Kent, sandwich, travel, walking. Bookmark the permalink. Wonderful story with great photos! The thatched roof huts are especially interesting.